I did it! I accomplished one of my goals. And I hate to toot my own horn, but toot toot! We scored 2cd place in the womens team division. Our time was 108.57 to complete a little over 4 miles with mud obstacles every half mile or so. It was the most amazing experience. It was hard, and I had some amazing friends who truely pushed me to go hard. We killed it! I am so looking forward to doing the next one. During the run, a bee or hornet or some yellow bee looking thing latched onto my knee. It about gave me a heart attack. I screamed, "AHHHHH somethings biting me!! !," and all I could think is that some deadly spider has just bitten me and I am going to die in the woods covered in mud...HA! Lukily, it was just a bee or hornet, but that sucker did not want to stop stinging me. It was hanging on for dear life, which freaked me out even more cause I was like, "get it off me!" And apparently there was a swarm by me, so my friend Samantha, is yelling at me to come this way and get away from the bees. It was crazy! Then when we got to this tire carrying obstacle, I, being such a smartie, pick up a huge tire. I could not figure out why everyone else was smoking me on this course, but by the time i figured it out, it was too late. I had to push through it. I bet that thing weighed 50 lbs! Lord, thank you for being with me cause I did not think I could make it after that. So, I overcame that one and we pushed ahead. We were all able to climb the vertical wall with the rope, which was amazing! I felt so strong after that one. It was like I was in a movie! 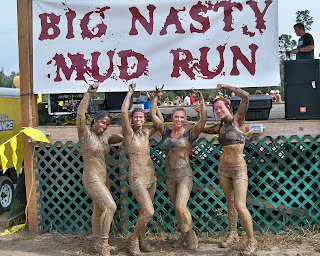 The last mud pit before the finish line was awful. I felt like my legs were in concrete. I could feel my quads struggling to push through and pull my legs up out of this mess, but it was so difficult. I crawled, I fell. I dug my way to the end. Then my friend Melissa who was struggling, but she was not giving up, she decided to sit down (almost collapse and seemed very out of it) right before we got to the official finish line. They still counted our time, but we had to get her up to keep her heartrate from dropping to fast. It was so amazing. I wish we would have had a photo of us on each side of her, supporting her and carrying her to the finish line. Overall, it was one of the most memorable moments of my life. 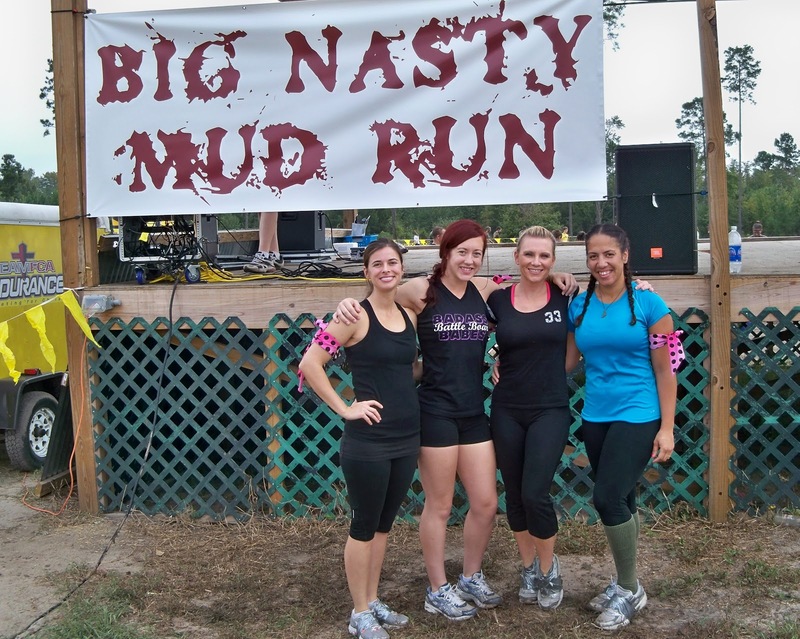 If you are considering a Mud Run, do it! It was incredible. I suggest you do some Insanity and run to get ready for it. I know Insanity helped me tremendously because my speed and agility in the mud and on the obstacles was definitly due to the Insanity workouts. The strength training from Les Mills Body Pump really gave me the muscle strength I needed to power through the mud and pull myself up on the obstacles. 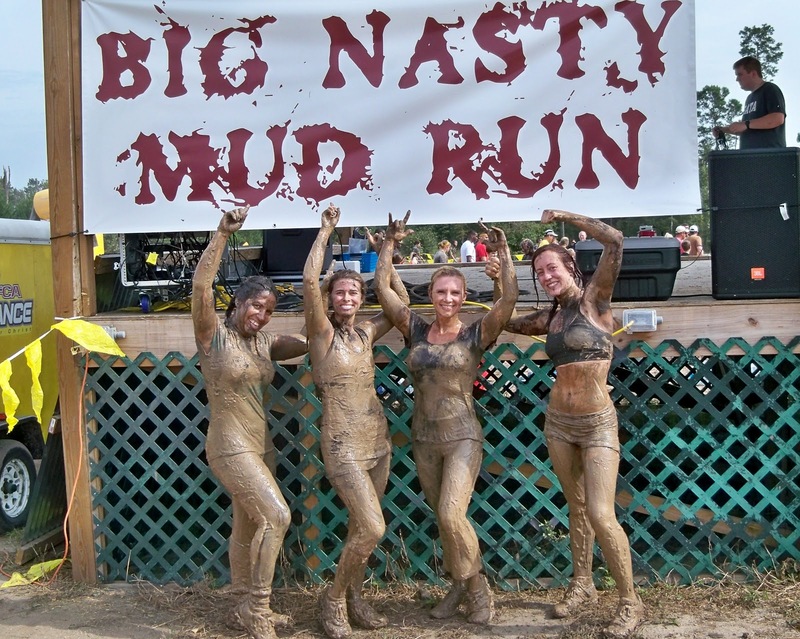 Have you done a mud run? What was your experience?